NEW! 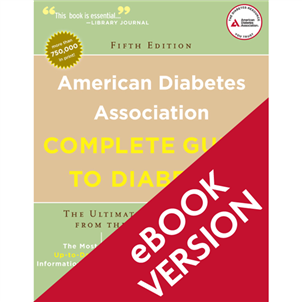 The American Diabetes Association Complete Guide to Diabetes is the one book everyone with diabetes should own. When it comes to managing diabetes, knowledge is your most powerful tool. For over seven decades, the American Diabetes Association has been leading the way in finding a cure and improving the lives of people with diabetes. With the American Diabetes Association Complete Guide to Diabetes, you have the go-to source for the most reliable information on diabetes self-care from the diabetes authority. From describing the different types of diabetes to breaking down the details on blood glucose monitoring, the American Diabetes Association Complete Guide to Diabetes covers everything a person with diabetes needs to know to stay healthy and in control. Now, this comprehensive resource is more current and helpful than ever. You're the best advocate for your health, so make sure you have the best resource at your fingertips—the American Diabetes Association Complete Guide to Diabetes.